- We can also supply Stone Jalis in various sizes and specifications to fulfill individual customer requirements. - The given pictures are for reference only and the actual Stone Jalis may vary in color, tone, marking and texture. We hold expertise in offering a comprehensive range of White Marble Carving Jali to our clients, which is used as partitions in facades and in building compounds. Our range is available in various attractive designs and dimensions, which can be customized as per the requirement of our clients. Furthermore, we offer our range to our clients at industry leading prices. 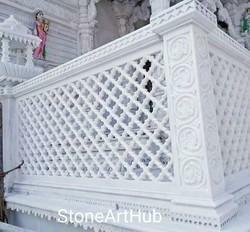 White Marble Jali is widely used and highly appreciable product in the market. The lovely and authentic work has been done on this product. Superior quality of marble has been used to give this product the new dimension. Add a flair to your balcony with an exquisite trellis, a wonderful framework. Available in Red, Beige, Pink, Brown, Mint, White, Grey, etc colors of sandstone and white, pink, green, black, etc colors of marble. We offer a wide range of marble grills that are effectively used as the means of security as well as ornamental pieces that enhance and reflect the beauty of the home decorations. We offer these grills at cost effective prices and therefore, these are appreciated worldwide. 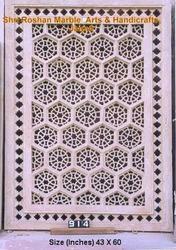 We are actively involved in providing an extensive range of Marble Jali. Due to high demand, professionals develop these products in varied specifications that meet on client’s demand. Use of premium standard stone and strikingly engraved designs is capable of bringing a timeless and unsurpassed beauty in the ambiance of garden. We offer mugal style marble jali. Clients can avail a variety of beautiful designs and motifs in these marble jali works. Marble jali is ideal for interiors and exteriors due to their unusual charm.